Kristine Langley Mahler is a memoirist experimenting with the truth on the suburban prairie outside Omaha, Nebraska. 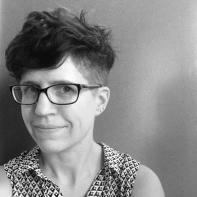 Her work received the Rafael Torch Award from Crab Orchard Review and has been recently published in The Normal School, New Delta Review, Quarter After Eight, The Collagist, Gigantic Sequins, and The Rumpus. I wasn’t ready for the gun show. I’d flexed my fingers around the steering wheel for the touch-over-two-hours it took to drive to the county fairgrounds in Hastings, Nebraska, a town of 20-odd thousand rural-ites sagging like a beer belly fifteen miles below the waistband of I-80. I couldn’t hide my hipster haircut or my nose ring, and I also didn’t think I could mask my skittishness around all those guns. My college roommate was a student at the other high school in Littleton in 1999—her high school got its shooting twelve years later. My last daughter was born the day before Sandy Hook, my high-school friend graduated from Virginia Tech. There is a link everywhere if you look for it, and I look for it, I look for a pattern to protect myself. I am a woman so agitated by gun violence that I advocate for the abolishment of the Second Amendment; every time there is another shooting (and there is always another shooting) I cry in frustration and fear—I am afraid for myself, afraid for my young daughters. But it had occurred to me that I was afraid of things that lurked in the brush, in the bushes, nightmarish fantasies I’d been too terrified to confront—I’d never even held a gun. Perhaps if I could flip on the porch light, I could see them for what they were: caricatures of an unexplored fear. But I didn’t want the attendees of the gun show to see me for what I was. I believed no one would talk to me about guns if I looked like an impostor, like a narc, like a you ain’t from around here are ya interloper; if there is a subset of the American population more defensive about their right to own defense than rural Midwesterners, I haven’t met them. So I went to meet them. I painstakingly assembled my outfit the night before, deciding on my husband’s oversized hoodie, a plain black t-shirt, my least-skinny-leg jeans, and a pair of worn-out sneakers, trying to desex myself. I worried about what I was doing by trying to dress down. What kind of generalizations was I inventing for the other attendees, thinking they’d suspiciously shun a woman who doesn’t “look” like them—what kind of generalizations was I inventing by anticipating gun enthusiasts as a pack of unfashionable women? But I woke up early on Sunday and I drove across the prairie to the Adams County Fairgrounds, a parking lot unsurprisingly crammed with pickups parking wherever the hell they wanted on the dusty gravel, dwarfing my sedan. I could see for miles in every direction—these are the flatlands of Nebraska that everyone thinks of when they mutter that crossing Nebraska is the most boring thing they’ve ever done; a slur I am quick to counter with the rolling river bluffs of Omaha, where I live. My stomach flipped over, but I slammed my car door, walking with contrived purpose to the entrance of the Activities Center, a large windowless building encased in beige sheet-metal, trying to look like a native, like I’d done this before. A man leaned over from his folding chair, took my four limp dollar bills and swiped a red marker across my right hand. And like that, I was in, moving without thinking into the room on the right, where the first thing I saw was the hide of a brown bear, skull turned to me, mouth open and pearly teeth bared, guns laden across its furry back. I flashed to the time I surprised a bear in the Montana wild, how I had incorrectly turned my back and walked away as fast as I could; I’d never wished I had a gun, I’d just wished I wasn’t there at all. But the older man does not walk behind the gun-laden table to which he has guided me. Another man, Lonnie, is standing behind the guns as Rich—I steal a glance at the embroidered name on his nylon jacket—picks his monologue back up, lifting a small gun—though not as tiny as the one I had pointed at—and tells me this is what I want, a 22, not a 38 like that one I was looking at; if I needed to shoot an animal, a raccoon or a squirrel or something, I could hit from here to that pop machine, that’s about as far as I’d need to shoot. Rich’s gelatinous front teeth are the only thing that keep me from hugging him. He looks like my best friend’s father—the same gray hair slightly dipping forward over the same tall forehead, the same 80’s-era eyeglasses. Rich both towers and hunches over me, leaning in close like old people do because they are from an era when proximity meant friendship, not a threat. I am delighted to have my first gun guide talking to me about shooting animals—the only justifiable reason to own a gun, from my viewpoint—but Rich immediately segues that if a guy’s coming at me and I need to shoot, now, I wouldn’t be able to shoot from here to the end of the room (we turn to see the far side of the hall, maybe fifty feet away), but I wouldn’t want to try to shoot a guy that far away; I don’t need to shoot him unless he’s close enough that I can get accuracy, I want him about as far away as that pop machine. Lonnie humors this demonstration, but I can tell he is confused by the relationship between Rich and me. I am confused by the relationship between Rich and Lonnie; it takes me several minutes to realize that Rich does not know Lonnie—Rich just knows the guns. Lonnie tells me to take a hunter-safety course, which I find fascinating because no one has asked me what I want a gun for—no one has even asked whether or not I want a gun. I only asked “What are you supposed to do with that little bitty gun?” because I was curious about the justification—I imagined the grandma would tell me it was used for a coup-de-grâce when hunting, but that suddenly seemed silly—I didn’t let logic take over and consider that it was a purse gun, which is what Rich advocates I get. A little 22, like I am supposed to have, costs around $300—at a gun show, anyway. A 22 is a revolver, not a semi-automatic like the baby gun I had asked the grandma about. Semi-automatics require you to slide the casing to pull back the hammer of the gun, and to remember to turn off the safety. Revolvers are better since you can pull that thing out and just shoot. No safety. You just shoot. I am baffled that these purse handguns have no safety mechanism. How many times have I disentangled my keys from something in my purse, fumbled around for a pen, told my daughters they can get my lip gloss? And I’m supposed to be carrying around a gun with no safety on it inside my purse? But Rich recently bought a 22 for his grandson, so it is implied that if his grandson can handle it, so can I.
I am stunned, though I don’t let it show, keeping my stride even, slow, measured, hoping my eyes are not flaring perceptibly. How can Lonnie live in Red Cloud, identify it by its moniker, and not know who Willa Cather is? I’m not a native Nebraskan and even I know—she’s Nebraska’s most famous daughter—but maybe that’s the old English major in me, and I realize my disguise must have worked. Lonnie presumed I wouldn’t know who she was either. I head to the miniature cafeteria on the east end of the hall, where I eat my first red Fairbury hot dog, dripping red water onto my paper plate, and a large slice of lemon meringue pie, which, together with my bottled water, costs $5. I sit at one of four round tables, two seats away from a young boy and a man in a high-backed paraplegic wheelchair. The man can move his arms, but he continues to ask the boy to pour him more water. I keep my eyes lowered because it feels appropriate, but I hope the man doesn’t think I’m uncomfortable by him—I’m uncomfortable in this whole situation. There are a few Latinx people but not an African-American in sight. Women walk a step behind their men, wearing freebie fundraiser t-shirts from construction companies, church softball leagues, wearing the boot-cut jeans with rhinestoned back-pockets popular a handful of seasons ago, towing their offspring. Though I congratulate myself on getting the top half of my attire correct, there are no other single ladies wandering around, and I realize I excluded the most crucial accessory: a man. “I’m the infidel Allah warned you about,” one man’s t-shirt hisses, displaying a skull with an American flag bandana tied across the bottom half of his face like a bandit. A man wearing a “Hillary for Prison 2016” t-shirt hangs up signs; he is clearly part of the Four Rivers Sportsman’s Club who have organized this event. There are beer guts and camo everywhere—hunters’ camo, not military camo. Ball caps and cowboy hats, carpenter jeans with ripped hammer loops and Wranglers with creases ironed down the backs. Unironic overalls and truly scuffed cowboy boots. Plenty of plaid, and it’s not grunge-revival. Though I linger uncomfortably long at most stalls, it should be noted—not a single gun seller ever approaches me or asks if I have any questions. There are no acned teenage boys beside me, examining the guns, compulsively bragging about their exploits. It’s like I have a force-field repelling the other attendees; though I try to keep a half-smile on my lips to look approachable, maybe they read my expression like I’m bemused, above it all, slumming for the day. I had hoped to ask someone about rifles, sham an interest in shooting animals—particularly, I want to ask about the efficacy of carrying that hot pink rifle I saw and to ask why women would be the only ones carrying a rifle an animal could see, because certainly those pink rifles would only be sold to women. But no one comes to the edges of the booths or even turns in my direction, and I feel uncomfortable enough—I feel like if I out myself as a graduate student to explain a blurt of questions, I will either be dismissed for the uselessness of book larnin’ or eyes will narrow: surely I am here to make fun of them, or to catch them breaking the law. So I shove my hands deeper into my hoodie pockets and stop trying to make eye contact with anyone—no one else is looking up either—all eyes are downcast, looking at the guns, or looking at the floor. I come upon a booth in the back of the other large room which is selling target practice sheets featuring female victims in need of rescue—one lady is being held from behind by a fat Caucasian-featured man with a potbelly, his arm across her windpipe, a blank sneer on his face. The other lady is being held hostage by a grandfatherly-looking farmer with a John Deere cap and overalls, which makes me uncomfortable because he looks like half the men in this room. You can also shoot at a zombie (or is it a meth-head? It’s very hard to tell), or you have your choice between an old white professor, a wild redneck, a man with vaguely Middle-Eastern features, and a black man with one hand up—hands up, don’t shoot—but pointing a gun at you with the other hand. The black man is the only man showing a sign of conciliation—am I supposed to read that upraised hand as false? A trick? All men, all men, not a single female target in sight on the target practice sheets. I wonder why we don’t need to practice shooting women. Or children. They’re all capable of being armed. I am ambling through the room, lingering fruitlessly at another stand of rifles when Rich, my gun guide, catches sight of me and calls me over to examine another 22. I am relieved to see him since no one has talked to me except when I was with Rich. Keith, his t-shirt tucked in, highlighting the ubiquitous beer belly, is alert, and he has a friendly face framed by a neat, trimmed chin-patch beard. Keith allows Rich to go through his routine of asking to see the 22 since it’s the gun he’s been recommending to me, and somehow Rich and Keith start talking about concealed carry versus open carry. The men are both in favor of open carry; Keith insists that he’s the kind of guy who would walk towards a gun—he’s not going to get shot in the back because, he repeats, he’s the kind of guy who walks into a situation (presumably only cowards get shot in the back). Keith continues to argue that open carry is better—Nebraska is an open carry state, he reveals, which suddenly terrifies me. How did I not know people could stroll through my local Walmart, guns visibly holstered to their sides? Keith always has a gun in his glove box. Keith drops his voice to inform us that state troopers are hardasses, the thing is that you just can’t give them a reason to go looking in your glove box. You gotta have two glove boxes, carry your license and registration in a different one. I am wondering what the hell kind of cars have two glove boxes, and what constitutes “concealment” since a glove box is just a place to temporarily store the gun so it’s not sliding all over the front seat, and what constitutes a “reason” to search a glove box during a traffic stop, but I shut my mouth before a liberal-tinged comment like “A reason like Driving While Black?” slips out and so I just sit back and let the men talk about guns. I nod my head and allow little hums of surprise or agreement to escape my lips; it doesn’t really matter, because Rich and Keith are exhibiting for me, not inviting me into the conversation. Neither of them have asked me if I’ve ever owned a gun. Neither of them have asked me if I want to own a gun. Rich’s nine-year-old grandson has a revolver without a safety. Look, there it goes, any shred of impartiality—it’s shrinking across the room: this is my future nightmare. Keith starts grinning that he’s always carried a gun—he drove a bus for the high school and he would always park right outside the parking lot and make the kids walk over to get on. One day someone from the district office asked him, “Hey, why don’t you drive up by the school?” and Keith refused. The man persisted and Keith said, “Because I’ve always got a gun on me,” and the man understood that Keith wasn’t about to get busted. One time the kids went over to Omaha for some kind of a state tournament and someone else drove them, and some bum walked up to the one cracked window on the bus and asked one of the kids for money. The guys on the bus all said, “Wonder what would have happened if Keith was there?” because they knew he would have shoved his gun right—well, almost right—in his mouth and said, “Would you like change?” What would the bum have done, gone to the cops? It is preposterous. This man was bus-driving around rural Nebraska with a load of under-eighteeners while packing heat, and he would have threatened to kill a man who was asking for spare change? Rich finally asks me where I’m from, and I say that I live outside Omaha—hoping it sounds more country because I really live in a suburb that directly abuts Omaha. Rich divulges that he always takes his 22 when he goes into Omaha. He goes into Omaha once a year, a little after Christmas—the wife likes to go to all the shopping malls even though she never buys anything; she likes walking around in all the stores at that mall—you know, the one where they had the shooting (“Westroads?” I supply. Yep, that’s the one.) and he just sits on one of those benches and watches all the people for a coupla hours. It’s a natural segue into “So is your husband around here somewhere?” and I tell Rich, no, actually, I’m supposed to meet a friend, which is a lie I have prepared ahead of time, and he counters by asking what a pretty lady like myself is doing wandering around a gun show all alone. It’s like every cliché I’ve ever heard. I stumble that my husband’s back at home working, which is also a lie, and my mom’s watching our kids, which is lie #3. My husband is at home watching our kids but I am convinced no man here would accept the truth: I left my husband at home, two hours away, to watch our kids so I could drive to this gun show alone. Rich nods his head, and I lie again about needing to call my friend, so I reach out and shake his papery old-man’s hand, thanking him for talking with me, and I mosey my way towards the door to leave. It gives me a small flicker of hope when I look up the state regulations on purchasing firearms at a gun show—Nebraska requires a license or permit, which in itself requires a background check—but only for handgun sales. This does not explain why no one approached me at the rifles—no matter what, someone could have sold me one. I shed my husband’s hoodie during the drive back home, ruffle my hair up into the tall curly quiff I prefer, and I think about Lonnie. I’ve lived in this red state for eight years, cocooning myself in the liberal-ish enclave of Omaha, ignoring the gun ownership protection laws that pass through legislature like clouds across the windy Nebraska sky—nothing can stop them; this is how it is out here. I think about the active-shooter drills my daughters practice at their elementary school—it’s a matter of course. How many times a year do I take the Von Maur elevator past the massacre site at Westroads Mall, how many times do I drive by the high school where a disgruntled teen shot the principal and vice-principal— the high school my daughters are slated to attend? These shootings occurred in my city, not in the country. The spent casings surround me, metallic fear clanging on the pavement outside my bedroom window. Lonnie doesn’t know where he lives, but neither do I.